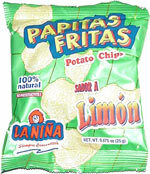 Taste test: These potato chips had a fairly limey taste, but it's not so limey that we couldn't also taste the potato. An unusual flavor, and pretty well done. Smell test: Smells like potato chips with sort of a very weak line smell.